Home » Criminal Justice » Is That A Banana In Your Hand, Or Are You Trying to Kill Me? Is That A Banana In Your Hand, Or Are You Trying to Kill Me? Somewhere near Grand Junction, Colorado, supposed would-be stand up comedian, Nathen Channing , was charged with Felony “Menacing” for allegedly pointing the insidious fruit at law enforcement Officers. Channing allegedly drawing and pointing a banana at officers “in the same manner someone would draw a standard handgun from a concealed holster,” according to an officer at the scene. Channing claimed he was simply joking, but the cops did not have a sense of humor. Can piss-poor timing and innapropriate prop usage land a comedian in jail on a Felony? Represent verbally or otherwise that he or she is armed with a deadly weapon. Channing’s story is that the banana stunt was simply a joke material (not to mention, he was a standup comedian). Even if it was not Channing’s intent to cause the deputies to fear for their lives, all that is required in Colorado is that he knowingly put someone in fear for their life where they reasonably could have believed he was exhibiting a weapon. Is it reasonable to believe that a yellow object pointed at you was a gun? 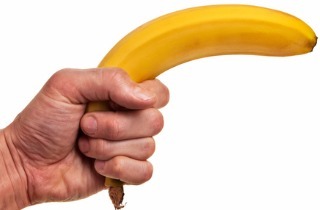 How many banana guns have you ever seen?